Our mission is to provide the people of this community the best dental services possible with genuine enthusiasm, warmth and commitment to quality. It is our goal to maintain a caring environment that is respectful of all people. All staff members are united in the effort to deliver excellent dental service and to make each patient as comfortable as possible. The arrival of your child’s first set of teeth is a natural and expected process. But that doesn’t mean this period of development, commonly known as teething, is an easy time: your baby will endure a fair amount of discomfort, and you, perhaps, a bit of anxiety. 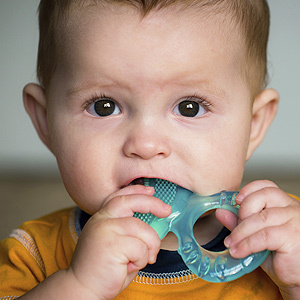 Knowing the facts about teething can help you reduce your child’s discomfort — as well as your own concern — to a minimum. Here are a few things you need to know. Teething duration varies from child to child. Most children’s teeth begin to erupt (appear in the mouth) between six and nine months of age — however, some children may begin at three months and some as late as a year. The full eruption sequence is usually complete by age 3. Symptoms and their intensity may also vary. As teeth gradually break through the gum line, your baby will exhibit some or all normal teething symptoms like gum swelling, drooling and chin rash (from increased saliva flow), biting or gnawing, ear rubbing, or irritability. You may also notice behavior changes like decreased appetite or disrupted sleep. These symptoms may be a minimal bother during some teething episodes, while at other times the pain and discomfort may seem intense. Symptoms tend to increase about four days before a tooth emerges through the gums and about three days afterward. Diarrhea, rashes or fever aren’t normal. These symptoms indicate some other sickness or condition, which can easily be masked during a teething episode. If your child exhibits any of these symptoms you should call us for an exam to rule out a more serious issue. Keep things cool to reduce discomfort. There are a few things you can do to reduce your child’s discomfort during a teething episode. Let your child chew on chilled (but not frozen) soft items like teething rings, wet washcloths or pacifiers to reduce swelling and pain. Gum massage with your clean finger may help counteract the pressure from the erupting tooth. And, if your doctor advises it, pain relievers in the proper dosage may also help alleviate discomfort. On the other hand, don’t use rubbing alcohol to soothe painful gums, or products with the numbing agent Benzocaine in children younger than two unless advised by a healthcare professional.